A real piece for the writers out there: Fay’s response to the trigger ‘call’, tells a moving story of how she came about writing the original poem. B N [battallion] EMBARKED ON TROOPSHIP S.S. CANTERBURY AT NEWHAVEN SUSSEX. FOR FRANCE. I can’t explain my feelings when I first read it. Uncle Vic was my mother’s little brother and they were very close. He was 3 years old and my mother was 7 when she was given the job of bringing him up. Their mother had died suddenly in 1921 and their father, a Durham coal-miner, had struggled with both his loss and being solely responsible for the welfare of 4 motherless children. I really admired my uncle Vic, better known as Dobbie. He was such a lovely man and would light up a room whenever he walked in. He always saw the funny side of everything and his words throughout the journal highlight this, brilliantly. Towards the bottom of the first page he writes, STILL HAD TO WADE THROUGH WATER. [160 BDE?] GERMAN SHELLS STILL WHINING OVER OUR HEADS INTO THE SEA. ON DRY LAND AT LAST BUT IN FRANCE. KEPT WISHING I HAD JOINED THE NAVY… which is the first of many funny quips he inserted into the most dangerous of situations. No wonder everyone loved him! He spent his 5 war years in the Welsh Regiment and was later mentioned in dispatches for distinguished service gallantry in North West Europe. His mates wrote to the local newspaper asking if they would include the letter, ‘FOR HIS FOLKS TO READ, AS THEY WOULD NEVER READ IT FROM HIM.’ They said. He’d been writing about the difficulty of keeping the ‘LINES’ operative due to ‘JERRY STONKING [SHELLING] AT REGULAR INTERVALS’, stretcher bearers [S-BS] bringing people in from the ‘COYS? and of the horrific injuries and lack of ‘FIELD DRESSINGS’. He describes how he and others had had to rip off their own field dressings to help a truck driver who was unloading his truck when it got a direct hit. He says ‘HE WASN’T HALF IN A MESS. HE WAS FULL OF HOLES AND THE BLOOD WAS RUNNING FROM HIS EARS EYES NOSE AND MOUTH’. Something not included in the journal, and only known by me because of listening in to family conversations. Later in the war his battalion was stationed behind enemy lines in The Reichwell Forest [not sure of spelling] somewhere in N.W. Germany. 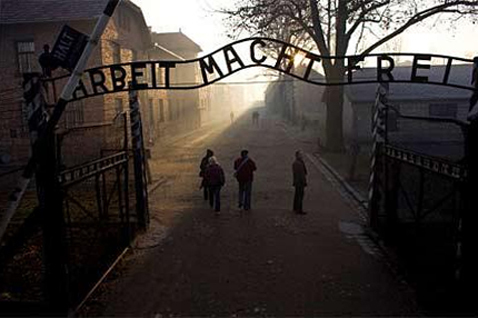 His battalion liberated Belsen/Bergen Concentration Camp, an experience he never ever came to terms with. 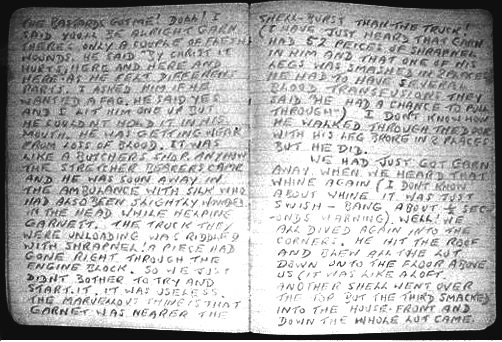 I feel very sad that my mother [the Nan or Nancy mentioned several times throughout the journal] knew nothing of it. He often wrote that he wondered how she was and what she was doing and I only found out about the journal myself because my cousin Peter happened to come across it when clearing out his mother’s [my auntie Minnie’s] affects, after she died. He then put it in a drawer and forgot about it for several decades. He was an old man when he passed it on to me in 2015 and asked if I would let uncle Vic’s kids know about it. Thankfully, my daughter Lisa helped me scan the 60 odd pages in the small, buff coloured notebook. She then enlarged and attempted to clarify them, while taking great care not to lose the integrity of the original, sometimes scribbled, faded pencil handwriting. I sent Ian, his eldest son, the original notebook, of which he knew nothing. We made 7 copies altogether and sent one to each of his 3 kids, another for cousin Peter and 1 each for me and my 2. 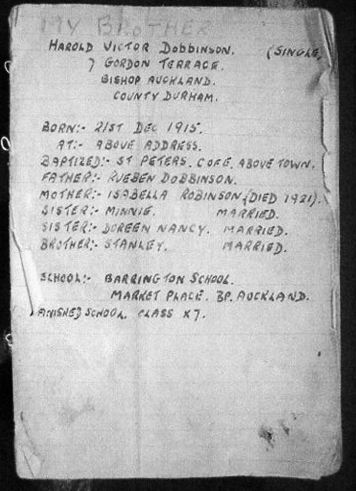 I heard recently that Ian has donated the original notebook to Bishop Auckland War Museum. Uncle Vic was a well-liked and highly respected Town Councillor for many years and a local park has since been created and named in his honour, with shiny brass plaque to prove it, something I’m sure he would have hated. and the fighting was not over yet. with beads of sweat running down his neck. wondering when he’d see her again. instead of the mud and pouring rain. Would she be waiting when all this was done? Would she consent to become his bride? Would they be happy and have many bairns? Would they stay together all their lives? and her lips were like soft pink rose buds. and of fresh new growth, so clean and good. with salty tears streaming down her face. still dressed like a maid, in snow white lace. and he just marched away from her arms. while suppressing the worst of his qualms. and was ready and eager to go. something we hope we will never know. ealing his fate with the roll of a dice. I very nearly didn’t finish it but the poem began to assert itself after I read the last few pages of the notebook for about the 5th time. Uncle Vic had made a list of all his ‘GIRLS’, starting when he was only 15 and I couldn’t understand why, until I realised it was probably to try and take his mind off what was happening to him or what he was expected to do. I imagine that anything from his youth would have been better than the reality of the situation, and listing his many girlfriends would have been a distraction he’d have welcomed with open arms. The last girl he wrote about was Margaret Wright, my mother’s best friend and much later, her bridesmaid. He said how lovely she was but that he was too shy. He said he would have asked her to marry him, but was too slow. In my poem, the soldier is thinking about Mary, his girl back home. A scenario that must have been played out many millions of times, in all the trenches or bivouacs of every war that has ever been fought. Also, I would like to dedicate the poem to the memory of my dad’s sister, auntie Louie, who was only 21 when she learned that her fiancee had lost his life in Ypres, on the same day he arrived there. This fact seemed to have coloured the rest of her life because she never married. I really loved my eccentric auntie Louie, she was certainly a one off, but most people saw her as a sad, weird, lonely old spinster until the day she died, aged 86. Both were defeated by strong men campaigning against them. Throughout Britain and the lands of the British Empire. He had achieved much of his life’s aim. After the passage of this bill into law. The system of preference for White South Africans. before Practicing in Johannesburg. Here he developed his political interests. These led to bitter disagreement with the Government. In 1962 he was arrested and charged with attempting to overthrow the state. He was sentenced to life imprisonment and served 27 years. From there he was elected to be President and set about rationalizing black and white. This he achieved and his country is now fit for both black and whites. With Freedom for both ethnic groups. ‘I am just a poor boy though my story’s seldom told’… is one of my mantras. My mother was incredibly practical, perhaps out of necessity as my father was not; perhaps from the make do and mend attitude of the war; perhaps because her father was a shoe mender – the inter war years being a busy time, but also one where customers did not return to collect the shoes he had repaired because they could not pay. My mother got permission to start work not at the statutory accepted end of her 14th school year, but the Monday after her October birthday, just two weeks after war was declared in 1939. For decades after her father died in 1956 (from his Great War wounds – gassing) we had one of his lasts in our cellar. This had use right into the eighties – a trade secret to stop heels rubbing – gently hammer out the leather to stretch it. One of our most famous family stories is about the time my Father got my sister and me to surprise Mother, who would normally wallpaper all by herself, by papering the hall ceiling for her while she was out at mass. All of us on ladders, he at one end, passed to Ces in the middle who passed it to me at the other end. We had difficulty making it stick in the stretches between us. It slowly drooped at one or two points and gradually, oh so gradually, gathered pace until it effectively dressed Ces atop her ladder. She was intrepid though. She did not let go her hand. She did let go of something else. At first the giggle … led to tears of laughter … before she eventually wet herself. When Ma returned there was a six inch patch of paper in the middle of the hall ceiling, a twelve inch puddle on the hall carpet, and a wasted roll of the wallpaper we could little afford in a corner. I do try to do all the jobs. Laying a hedge I swung the billhook back and caught the back of my head. Only the dufflecoat hood saved serious injury. I’ve electrocuted myself fixing the washer, and broken a finger dropping a car axle onto it. Though the list of fixables did reduce over the years, I persevere, I am intrepid. I’ve fixed the flat screen TV in the last year … but now I am a bit of a ‘Gunner’ and the list of things I’m gunner fix is getting longer again. DON’T FIX THE FLIPPIN’ THING, JUST BUY ME A NEW ONE! As a group, the sad truth is that Human Beings as a race do not take care of each other. Indeed, through history the evidence is that Wars have sought better and more efficient ways to cause such harm. This truth was brought vividly to my attention some years ago. The year was 1978. I was talking to the Chief Scientist of a company called Cary Scientific Instruments in Metuchen, New York, USA. The purpose of my visit was to assess one of Cary’s Raman Spectrometers with a view to its possible purchase for research at Nottingham University, a mere £70,000 . The Chief Scientist was an interesting man, I guess about twice my age. He was an expert in the use of spectroscopy for chemical analysis. Their machine was state-of-the-Art: laser powered, and computer driven. By comparison my machine at Nottingham would have looked out of date at Stonehenge. I continued our conversation by asking him what was his background. He explained that he did his first degree at Harvard followed by his PhD , and then he joined the US Army’s technical branch just as the war started. He found himself being seconded to the Manhattan Project – the Atomic Bomb. He went on to explain the excitement of developing techniques for purification of Uranium and methods for measuring it. He had witnessed several bomb tests in the Mexican desert, which he said were astounding. ‘But none of us realized what the impact would be’. He then went on to describe the dropping on Hiroshima. ‘We were all horrified at what we had developed and the magnitude of the effect,’ he said. I was slightly shocked to note he had tears in his eyes. He continued that as soon as he could he left the US Army’s Technical Branch and returned to civilian life. This encounter had a profound impact on me and ever since I have considered the impact of any research I do.